JETHRO TULL-THICK AS A BRICK-STEVEN WILSON MIX. Jethro Tull came of age musically in 1971. That’s when they released Aqualung, the most successful album of their four album career. Aqualung sold three million copies in America, and was certified triple platinum. This surpassed the success of their three previous albums, including 1969s Stand Up and 1970s Benefit. Both were certified gold in America. However, Aqualung was a game-changer. Suddenly, Jethro Tull were one of the biggest bands in the world. They were well on their way to becoming one of the most successful, groundbreaking and innovative prog rock bands. Partly, that was down to Jethro Tull’s determination to reinvent themselves musically. Jethro Tull weren’t content to stand still. Instead, they experimented musically, and pushed musical boundaries to their limit. This saw Jethro Tull become one the most groundbreaking and inventive bands. However, very few people were prepared for Thick As A Brick, the followup to Aqualung. Thick As A Brick, which was recently reissued by PLG, was a concept album. Not just any concept album though. Instead, Thick As A Brick was a concept album featuring just one lengthy track. This track, Jethro Tull described as “bombastic” and “over the top.” It was meant to be an adaptation of an epic poem written by an fictional eight year old prodigy. It’s meant to be Homeric, but with a bombastic, humorous style. The album came complete with a cover that replicates a comedic newspaper, which features the poem penned by the child prodigy. In reality, the lyrics were written by Ian Anderson, Jethro Tull’s lead singer. Up until then, he could do no wrong. Was this about to change? The origins of Jethro Tull can be traced to Blackpool, in 1962, That’s when Ian Anderson formed his first group Blades. Originally a four piece, featuring Ian Anderson on vocals and harmonica, they became a quintet in 1963 and sextet in 1964. By that time, they were a blue eyed soul band. After three years, the band decided to head to London. Having moved to London, the band split-up within a short time. Just Ian Anderson and bassist Glen McCornick were left. This proved a blessing in disguise. They were soon joined by blues guitarist Mick Abrahams and drummer Clive Bunker. This was the lineup that featured on their debut album This Was. That was still to come. Before that, the band had to settle on a name. Various names were tried. Then someone at a booking agent christened them Jethro Tull, after the eighteenth century agriculturalist. Not long after that, Ian Anderson acquired his first flute. Up until then, Ian Anderson played just harmonica and was trying to learn to play the guitar. He realized wasn’t a great guitarist though. So, decided the world had enough mediocre guitarists, decided to expand his musical horizons. So he bought his flute. Little did he realize this would be one of Jethro Tull’s trademarks. After a couple of weeks, Ian had picked up the basics of the flute. He was learning as he played. Not long after this, Jethro Tull released their debut single. Sunshine Day was penned by Mick Abrahams, with Derek Lawrence producing the single. On its release, the single was credited to Jethro Toe. It seemed thing weren’t going right for Jethro Tull. The single wasn’t a commercial success and failed to chart. Despite this disappointment, thing got better when they released their debut album This Was. Recording of This Was took place at Sound Techniques in London. The sessions began on 13th June 1968, and finished on 23rd August 1968. Unlike later albums, Jethro Tull recorded This Was on a tight budget. Only £1,200 was spent recording Jethro Tull’s debut album This Was. This money would soon be recouped when This Was released. Having released their debut album This Was in 25th October 1968, it reached number ten in the UK. This Was was well received by critics. They were won over by Jethro Tull’s fusion of blues rock, R&B and jazz. This lead to This Was being launched at the Marquee Club. Jethro Tull were only the third band to launch their debut album at the Marquee Club. The other two were The Rolling Stones and The Who. Both were now amongst the biggest bands in the world. They had certainly conquered America. So would Jethro Tull. When This was released in the US on 3rd February 1969, it reached just number sixty-two in the US Billboard. This was seen as a success by Island Records in Britain and Reprise in America. Jethro Tull had made inroads into the most lucrative music market in the world. It was a successful start to Jethro Tull’s career, which was about to enter a period where critical acclaim and commercial success were almost ever-present. However, there was a twist in the tale. Prior to the recording of Stand Up, Jethro Tull’s sophomore album, Mick Abrahams left the band. Mick and Ian Anderson disagreed over the future direction of Jethro Tull. The problem was, Mick wanted Jethro Tull to stick with blues rock. Ian Anderson realised there was no real future in blues rock. He wanted to take Jethro Tull in different directions, exploring a variety of musical genres. So Mick left Jethro Tull and was replaced by Michael Barre. Little did either Mick nor Michael realize that Stand Up marked the start of a period where Jethro Tull sold over sixty-million albums. Following the departure of Mick Abrahams, who was replaced by Michael Barre work began on Jethro Tull’s sophomore album. It would be very different to This Was. Stand Up was a much more eclectic album. Ian Anderson, who was now the primary songwriter, penned nine of the ten tracks. He drew inspiration from everything from blues rock, Celtic, classical, folk and rock. The ten tracks became Stand Up, which was recorded over three months in 1969. Recording of Stand Up took place at Morgan Studios and Olympic Studios. The sessions began in April 1969, and continued through to May 1969. They recommenced in August 1969, when Stand Up was completed. A month later, and Stand Up was released. Before the release of Stand Up in September 1969, reviews of the album were positive. The musicianship and production were praised. Whilst there was still a blues rock sound, Jethro Tull were expanding their musical palette. This struck a nerve with critics and record buyers. On its release in September 1969, Stand Up reached number twenty in the US Billboard 200 Charts and number twenty in Britain. This resulted not just in the start of Jethro Tull’s first gold disc of their career and the beginning of a golden period in their career. The next album in this golden period was Benefit. Following the commercial success of Stand Up, Jethro Tull returned to the studio in December 1969. Ian Anderson had written ten new tracks. These ten tracks were recorded at Morgan Studios, London. For the first time, Ian Anderson was the sole producer of a Jethro Tull album. He started as he meant to go on, producing what would become a much more experimental, and darker album, Benefit. It was completed in January 1970 and release in April and May 1970. Before the release of Benefit, the critics had their say. They remarked upon the much more experimental sound of Benefit. Ian Anderson had allowed Jethro Tull more freedom to express themselves. He also wanted Benefit to have a live sound. This shines through. So, does Benefit’s darker sound. This Ian Anderson claimed was because of the pressure of a forthcoming American tour, and his disillusionment with the business side of the music industry. However, this didn’t affect sales. When Jethro Tull released Benefit in the America. It was released 20th April 1970, and reached number eleven in the US Billboard 200 Charts. This meant another gold disc for Jethro Tull. However, how would British record buyers react to Benefit? Already, Jethro Tull were more popular in America, than in Britain. Stand Up, Jethro Tull’s previous album was more successful in America, than Britain. It seemed American record buyers “got” Jethro Tull more than their British counterparts. Benefit just reinforced this. Upon its release on May 1st 1970, Benefit reached number three in Britain. While there was no gold disc, Jethro Tull were on a roll, and about to release a classic album. By December 1970, Jethro Tull had just returned from their American tour. They were on a gruelling schedule, where they recorded an album, then embarked upon long, exhausting tours. It wasn’t ideal, and already, Ian Anderson wasn’t enjoying the months away from home. He missed his friends and family. However, this was one of the downsides of being a member of one of the most successful rock bands in the world. So, while others were readying themselves for the forthcoming festive season, Ian Anderson and the rest of Jethro Tull were about to begin recording their fourth album, Aqualung. Despite Jethro Tull’s gruelling touring schedule, Ian Anderson’s creativity hadn’t been stifled. Far from it. Ian returned with the lyrics to Jethro Tull’s most ambitious and cerebral album, Aqualung. It was a concept album that examined ”the distinction between religion and God.” This seemed an unlikely subject for an album, even a seventies concept album. However, Aqualung, which feature two new members, would transform Jethro Tull’s fortunes. As Jethro Tull arrived at Island Studios in December 1970, two new members made their debut. Keyboardist John Evans and bassist Jeffrey Hammond were the latest recruits to Jethro Tull. Right through to February 1970, Jethro Tull recorded their most cerebral and philosophical album. Aqualung was produced by Ian Anderson and Terry Ellis. It was also their most successful album. As copies of Aqualung were sent out to critics, executives at Chrysalis and Reprise awaited their reviews with baited breath. They need not have worried. Most of the reviews were positive. Reviews remarked upon the quality of the music, the standard of the musicianship and Ian Anderson’s lyrics. Many critics hailed Aqualung Jethro Tull’s finest album. Since then, Aqualung is seen as a classic album. However, forty-five years ago, critics embraced they hailed as an extremely cerebral album. Aqualung was music for the mind, and music the world would embrace. On the release of Aqualung on 19th March 1971, it reached number seven in the US Billboard 200, and was certified triple platinum. Across the Atlantic, Aqualung reached number four in Britain. Elsewhere, Aqualung reached number five in Germany, and was certified gold. In total, Aqualung sold over seven million copies. This transformed Jethro Tull. They were now one of the biggest rock bands in the world. For the two new members of Jethro Tull, this must have been hard to take in. Suddenly, the were part of a band who had just sold over seven million albums. This doesn’t happen often, even in the seventies, the heyday of the album. However, after the success of Aqualung, another member of Jethro Tull decided to call it a day. Drummer Clive Bunker had been a member of Jethro Tull since the early days. He was part of the furniture, and replacing him wasn’t going to be easy. However, at least Clive Bunker had been able to enjoy what was the most successful album of Jethro Tull’s career, Aqualung. Following up Aqualung wasn’t going to be easy. What nobody expected, was that Ian Anderson would’ve penned one lengthy track that took up both sides of Thick Of A Brick. Side one of the original album featured Thick as a Brick Part I, while side two featured Thick as a Brick Part II. This song of two parts comprised Jethro Tull’s latest concept album. Following critics conclusion that Aqualung was a “concept album,” Ian Anderson decided to have some fun at the critic’s expense. He decided to “come up with something that really is the mother of all concept albums”. One of his influences was Monty Python. Another influence was the movie Airplane. Just like Airplane poked fun at the cinema goers, filmmakers and critics, Thick Of A Brick saw Jethro Tull poke fun at their audience and music critics. However, Jethro Tull weren’t laughing at their audience, they were laughing with them. They maybe, were laughing at other groups. When Jethro Tull entered the Morgan Studios, on 10th December 1971, Jethro Tull had a new drummer, Barriemore Barlow. Thick As A Brick wasn’t his most exacting album with Jethro Tull. Far from it. meant to be pseudo Homeric, but with a bombastic, humorous style. The album came wrapped in a cover that replicates a comedic newspaper. It features the poem penned by the child prodigy. Although Thick As A Brick’s album cover and the album had spoof written all over it, many people didn’t get Jethro Tull, or more specifically, Ian Anderson’s unique style of humour. It was way too subtle. With Thick As A Brick complete, and the fictional Gerald Bostock’s epic poem brought to life, copies of the album were sent out to critics. They hailed the album one of Jethro Tull’s finest. The music on Thick As A Brick was groundbreaking, innovative, slick and sophisticated. Most critics were won over by music that was complicated, but tinged with subtle humour. Incredibly, some critics failed to find the funny side of Thick As A Brick, and bought it hook, line and sinker. They failed to see that Jethro Tull were poking fun at the concept album, and laughing along with their audience at what Ian Anderson perceived as its pomposity. However, what very few critics overlooked was Jethro Tull’s first prog rock offering. Thick As A Brick marked the completion of Jethro Tull’s move towards prog rock. They had toyed with the genre before. On Thick As A Brick they embraced it. There were numerous musical themes, changes in time signature and tempo shifts on Thick As A Brick. Even the instruments used differed from Jethro Tull’s early blues rock offerings. Never before had harpsichord, lute, saxophone, timpani, trumpet, violin or xylophone featured on a Jethro Tull album. This was a first. What Ian Anderson regarded as a satirical album, marked the beginning of Jethro Tull’s conversion to prog rock pioneers. When Thick As A Brick was released, it came wrapped in a pun riddled cover. It was disguised as a British regional newspaper, and openly mocked the style of journalism that prevailed in these provincial publications. Thick As A Brick’s newspaper cover poked fun at the style of journalism. Most of the cover was designed by Ian Anderson, with the rest of the band having a hand in the design. Ironically, the cover took longer to design than the album took to record. However, it proved to be worth the effort. 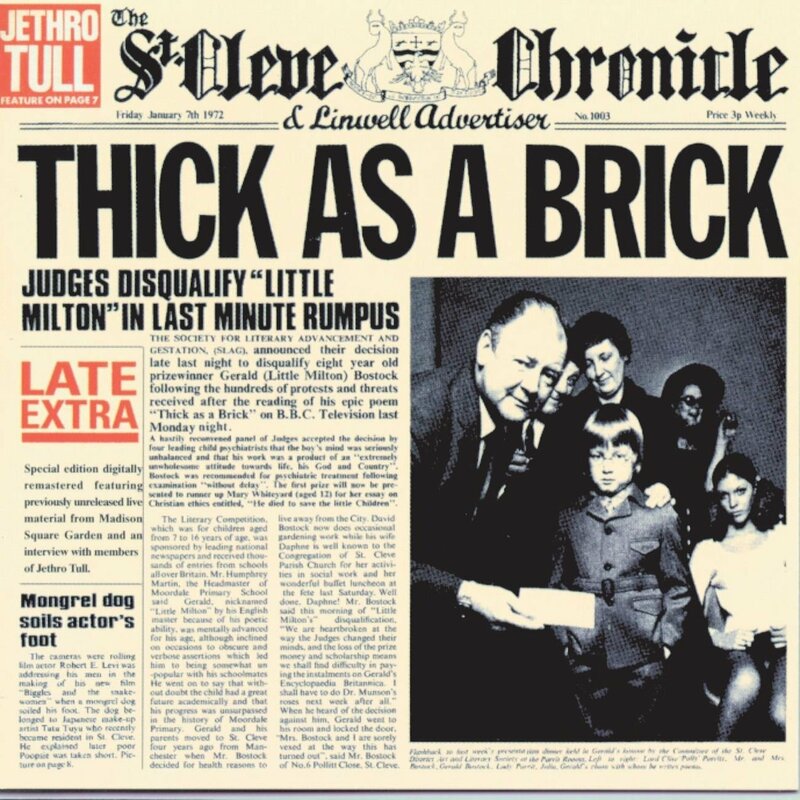 On 10th March 1972, Thick As A Brick was released, it reached number one in Australia, Canada and the US Billboard 200 charts. Back home in Britain, Thick As A Brick reached number thirteen. This wasn’t unlucky for Jethro Tull. Thick As A Brick proved to be Jethro Tull’s most popular album in Britain. It was certified silver, while Thick As A Brick was certified gold in America. Ian Anderson’s parodic concept album saw Jethro Tull triumph again, as they became prog rock pioneers. Following Thick As A Brick, Jethro Tull went on to see eight further albums certified gold. In total, Jethro Tull sold over sixty-million albums over a recording career that lasted five decades. The most successful period of Jethro Tull’s career came between 1969s Stand Up and 1989s Rock Island. During that period, Jethro Tull were one of the most successful bands in the world. Their albums sold by the million, while their tours sold out. That’s not surprising. Jethro Tull were one of the most innovative bands of their generation. Before Thick As A Brick, Jethro Tull experimented musically. Thick As A Brick was a turning point in Jethro Tull’s career. It sees Jethro Tull full embrace prog rock. Before Thick As A Brick, they had toyed with prog rock. Not any more. On Thick As A Brick, Jethro Tull became converts to the prog rock cause. Jethro Tull were like Paul on the road to Damascus. Following this conversion to prog rock, Jethro Tull constantly, sought to reinvent themselves, and their music. They were determined not to stand still, and constantly release music that was ambitious, cerebral, groundbreaking and sophisticated. Aqualung had been the most cerebral album of Jethro Tull’s career. Thick As A Brick was the most ambitious and sophisticated. It was also tinged with subtle satire, satire that forty-three years later, has stood the test of time. Thick As A Brick which was recently released by PLG. This however, is no ordinary reissue. It’s Steven Wilson’s Stereo Mix. While many purists will hold up their hands at the thought of Jethro Tull’s albums being remixed, they need not worry. Just like previous albums Steven Wilson has mixed, his mix bring out all Thick As A Brick’s subtleties and nuances. Thick As A Brick, and its numerous musical themes comes to life. Steven Wilson’s new mix highlights the changes in time signature and tempo shifts. Similarly, the eclectic palette of music instruments deployed by Jethro Tull can be heard much more clearly. They stand out in the mix. Especially, the harpsichord, lute, saxophone, timpani, trumpet, violin or xylophone. The use of these instruments marked a stylistic departure for Ian Anderson and Jethro Tull. Never before had they used such an eclectic selection of instruments before. However, Thick As A Brick was a first, and marked Jethro Tull’s Damascene conversion to prog rock pioneers on Ian Anderson satirical pièce de résistance.